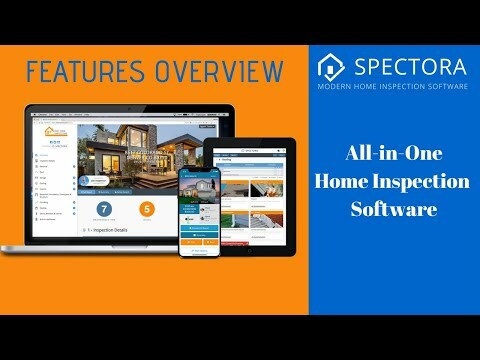 Created for modern user-experience, Spectora is home inspection software that is designed for creating interactive, professional and easy to read home inspection reports. Spectora's web-based and intuitive report writing software and mobile applications produce modern reports. Mac/iOS and Android/PC friendly, Spectora is built with the modern home inspector in mind and utilizes technology to be more efficient, produce elegant reports, and grow the business. It offers a quick learning curve and powerful tools to manage your agent and customer outreach. Spectora's agency-class marketing support gives users personalized advice on how to increase their SEO and online presence to get more agent referrals and customer leads. With Spectora, inspectors can increase the efficiency of their reporting through automated client communication, online payments, and useful operational indicators. The software also automates tasks like inspection reminders, online scheduling and agreement acceptance. The reports created by Spectora feature prominent videos and images to aid with understanding and illustrate issues. The sidebar navigation and jump links allow agents and clients to find the information quickly, and the user can even filter by high-priority items, full report or all deficiencies. The software allows the clients to view a photo in a full-screen lightbox and examine the hard-to-see details. For those who want the low-tech approach, the software has visually appealing PDF output. It even has Texas WDI, TREC, and Florida Wind Mitigation PDF outputs. Spectora as a team is unmatched. Period. Before I choose to go with Spectora I reached out to them with a question and received a reply the same day. We then set up a phone call for Christmas Eve to talk through my questions. From the website build to the launch they answered every question I threw at them and were willing to help out in any way they can. They helped me set up GSuite and then switched the domain for me when I changed my mind on which to use (they were able to make this change, I think, because it had been only a day since the initial set up) but the fact that they were willing to try spoke volumes! Bottom line, I have high standards for customer service - these guys blew those standards out of the water! I cannot say enough good things about them. The inspection software is strong, the app is strong, their websites are awesome, and their team of service minded individuals leaves everyone else in the dust. Don’t take it from me, call them! The software system itself does a lot. It’s a full service inspection software and CRM in one. I considered options such as Tap Inspect and others but they didn’t have all the tools Spectora does. I would’ve ended up paying more and using two separate companies to do everything that Spectora can do as one organization. The software system itself does a lot. It’s a full service inspection software and CRM in one. I considered options such as Tap Inspect and others but they didn’t have all the tools Spectora does. I would’ve ended up paying more and using two separate companies to do everything that Spectora can do as one organization. The software can be manipulated in the app but it’s not as easy or intuitive as TapInspect. However, Tap doesn’t offer as many manipulations as Spectora. The trade off is this - do you want something you can easily easily alter in the field or do you want something that serves ALL of your needs. With Spectora you can manipulate your report in the field but the easiest way to do it is from the computer. I prefer the one that allows more features. Don’t get me wrong, their app is awesome and allows me to complete the report port in the field very easily. It’s the altering (adding or removing) of the template I am referring to. Nothing short of amazing. I was reluctant at first, thinking this was just way too radical of a change. Worried about feedback from agents and customers. Within the first two weeks, I flushed those concerns down the drain. Nothing but positive feedback. I was so happy with the software that I decided to give them a try for building a new website. This experience was over the top, with the representatives constantly communicating through the entire process. The site looks wonderful and I am anxious to see where the future leads with everything Spectora! Easy to set up and begin using it right out of the box. Templates are available to fit your basic needs and then you can easily build upon them to customize your reporting. So simple to use compared to other inspection software systems, the learning curve is very short. Customer Service is also a high point, with help being available almost instantly. The team at Spectora goes out of their way to help their customers which is a huge selling point. Did I mention the reports look great? Did I mention they look nothing like any other software generated report in the industry? How about a few clicks from the agent and they can generate a repair request for negotiations which includes pricing? Seriously the new features that keep rolling out every month on Spectora are incredible! I do not think the folks at Spectora ever sleep. Easy to set up and begin using it right out of the box. Templates are available to fit your basic needs and then you can easily build upon them to customize your reporting. So simple to use compared to other inspection software systems, the learning curve is very short. Customer Service is also a high point, with help being available almost instantly. The team at Spectora goes out of their way to help their customers which is a huge selling point. Did I mention the reports look great? Did I mention they look nothing like any other software generated report in the industry? How about a few clicks from the agent and they can generate a repair request for negotiations which includes pricing? Seriously the new features that keep rolling out every month on Spectora are incredible! I do not think the folks at Spectora ever sleep. Cost. It is not cheap. However, it is the Cadillac so I expect it will not be cheap. Matter of fact, I am not a cheap inspector, so why would I use cheap software? Though pricey, it has been worth its weight in gold. You get what you pay for. A great product and fantastic support come with a cost. Previously it was a time consuming to do multiple tasks via different methods to schedule an inspection, so the ability to do pretty much do everything from one access point is a stellar business advantage. I am looking forward to growing in my skills with using Spectora to become fully mobile. In general, I have had a positive experience in using Spectora.I like the ability to edit templates with ease, copy from one template to another, and copy a section(s) within a report to another section of the report. All done with relative ease. I like the scroll down layout in reporting. The overall scheduler and inspection details on front end as well as invoice system, sending of inspection agreement as well as automatic generation of emails and many other features are huge time savers. The tracking system and database features are critical in having information stored and easily accessible. Most importantly, even though I have always produced well written and thorough narrative reports, the software is allowing me to go from good reports to great reports, because I am saving time and reinvesting that time to producing ever higher quality, detailed reports. I like the ability to edit templates with ease, copy from one template to another, and copy a section(s) within a report to another section of the report. All done with relative ease. I like the scroll down layout in reporting. The overall scheduler and inspection details on front end as well as invoice system, sending of inspection agreement as well as automatic generation of emails and many other features are huge time savers. The tracking system and database features are critical in having information stored and easily accessible. Most importantly, even though I have always produced well written and thorough narrative reports, the software is allowing me to go from good reports to great reports, because I am saving time and reinvesting that time to producing ever higher quality, detailed reports. The software is probably the most expensive software on the market; however, I believe ultimately you get what you pay for. I tell this very same thing to potential clients who are looking for the least costly Inspector. Hence, I best not be the pot calling the kettle black. On occasion, I have some technical issues with the software, but customer support is always quick to pounce on issues especially if it's an anomaly or possible bug on their end. My only concern at this juncture with the software is that they have many inspectors that want many different changes. In my opinion, this could lead to additional development issues or bugs as they keep playing with the software while perhaps the software doesn't have other issues resolved. No reporting software has ever produced something comparable to my custom Reports - until SPECTORA! This software has allowed me to significantly increase my volume of inspections, while at the same time the quality of my Reports hasn't suffered at all, in fact in some ways they have improved compared to my custom reports that I have been using for the past 6 years. My clients and Realtors alike are all enjoying the new Reports and have nothing but great things to say about how they are VERY easy to read, yet they have an abundance of valuable information which has helped them make smart decisions when looking to purchase the property they had us inspect.The "what-you-see-is-what-you-get" concept makes it super user-friendly which means the learning curve is very low compared to the other "competitive" software out there. The software also incorporates lots of top-notch abilities such as drag-and-drop sections, comments, etc., in-app image editing, video embedding and last but not least, the ability to Report on-site using your mobile device WITHOUT using data, you just upload to the cloud using Wifi or data whenever you're finished. I can't express enough how impressed I am with the boys over at Spectora, their customer service and response to our requests for new features and customisation happens lightning fast and their commitment to producing a game-changing software in less than 12 months has allowed them to enter a market dominated by VERY outdated programs and literally knock all the other BIG players out of the game. Spectora is THE next generation of Home Inspection Reporting software! The "what-you-see-is-what-you-get" concept makes it super user-friendly which means the learning curve is very low compared to the other "competitive" software out there. The software also incorporates lots of top-notch abilities such as drag-and-drop sections, comments, etc., in-app image editing, video embedding and last but not least, the ability to Report on-site using your mobile device WITHOUT using data, you just upload to the cloud using Wifi or data whenever you're finished. I can't express enough how impressed I am with the boys over at Spectora, their customer service and response to our requests for new features and customisation happens lightning fast and their commitment to producing a game-changing software in less than 12 months has allowed them to enter a market dominated by VERY outdated programs and literally knock all the other BIG players out of the game. Spectora is THE next generation of Home Inspection Reporting software! Excellent software with an excellent team to back it up. The experience of using the Spectora app in the field makes home inspecting a breeze, and leaves very little work to be done tidying up the report afterwards, if any at all. The report templates are highly customization and make for easy tweaking to enhance speed and usability in the field. The finished product is a beautiful, scalable, web based report that looks good on computers, phones, and tablets, with the option of producing a PDF file right on the page. I receive many compliments about how professional the reports look. Their entire system has many options for automating many business related emails, helping clients sign agreements and pay with just a few clicks right from an automated email sent out after booking. They have integrated well with google and apple calendars, making integration with my schedule very easy. On top of all that, their customer service is quick, smart, and enjoyable to work with. Everyone that works for this company right now loves what they do and are always working hard to make it a better product, and a better experience for users. I struggle to find anything about Spectora I don't like. Any issues I've ever had have been so quickly resolved, or have been items that the company continues to enhance, that they cease to be problems. Monthly: $99/month - $69/month for additional inspectors. Annual: $999/year - $588/year for additional inspectors. Contact Spectora on more information about pricing packages. • The platform is fully customizable to suit the needs of the user’s workflow. Also, it focuses on easy navigation, on-site reporting, and in-report template updating. • The Spectora photo editor comes with circles/arrows that point out defects. • The platform is compatible with all devices including PC, Mac, Windows, Android phone or tablet, and iPhone and iPad. • Offers agency-class marketing supports that gives users personalized advice on how to increase SEO and online presence to get new leads. Below are some frequently asked questions for Spectora. Q. What type of pricing plans does Spectora offer? Q. Who are the typical users of Spectora? Q. What languages does Spectora support? Q. Does Spectora support mobile devices? Q. Does Spectora offer an API? No, Spectora does not have an API available. Q. What other apps does Spectora integrate with? Q. What level of support does Spectora offer?